Rio Salado College | RioNews: Rio Salado Welcomes New MCCCD Students! Rio Salado Welcomes New MCCCD Students! A warm welcome to all of the new Maricopa Community Colleges students! 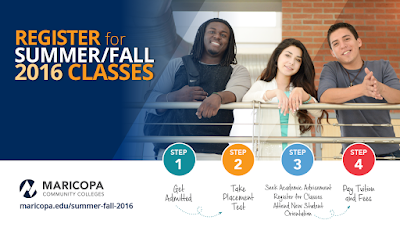 Today is the first day you can begin registering for summer and fall classes! We look forward to helping you on your educational journey! Ready to take classes now? There's no need to wait with Rio Salado's flexible Monday starts! *$84/credit for Maricopa County residents. Please work with your academic advisor and financial aid team to make sure you are meeting SAP and Block Calendar requirements. Learn more about both of these important issues by visiting this web page.